Quick! Go check your to see if your Facebook dashboard looks like the one on the left or the one on the right. If you have the new new “lock and lines” icon next to the “home” button on your facebook dashboard, then you’ve already received Facebook’s new privacy update. This week, the world’s largest social network began rolling out some new features with a streamlined approach to privacy. Some of you may be thinking, taking “shortcuts” isn’t exactly the best way to go about handling privacy and security setups, but when it comes to Facebook, we should be grateful for anything making it easier to protect ourselves and our identities. Facebook’s new privacy settings certainly aim to make management simpler for the average user, but like any Congressional bill with a pleasant-sounding name, benefitting the populace was but one motive for the change. Perhaps the most unpopular change coming during this new security phase has to do with Facebook search. 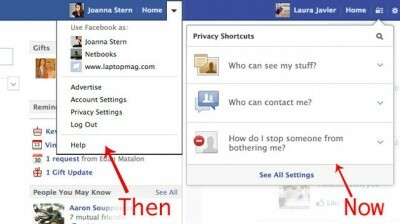 It is no longer possible to hide yourself and your profile from returning as part of Facebook’s search results. Back in June, I demonstrated how to make it so people couldn’t search for by name, email address, or phone number. No one could find out you were using the social network unless you sought them out. Well, things have changed and it’s not really like that anymore. If someone wants to see if you’re on Facebook, they can look you up. They still won’t be able to access your profile or contact you if you don’t want them too, but they’ll know you’re there. It would be pretty easy to get around this by linking your Facebook with an e-mail adress that nobody knows about, and using a clever nickname. For example: if my Facebook name were Pat M. instead of Patrick McMullen, it would be very difficult to track me down on the site. This is a big change: the log that displays literally everything you’ve ever done on Facebook—tagged photos, statuses, Spotify songs—is now easier to browse. There’s a chronological Timeline search on the right side, which will make jumping around through your past easier. You’ll also be able to quickly sort your history, allowing you to, say, find all of the photos you’re tagged in but don’t show up in your profile. Photos you might want to be aware of, but aren’t. The new design also allows you to make changes en masse—for example, untagging yourself from a bunch of unflattering photos at once, or deleting multiple status updates. When I finally get the new security update in the next few weeks, I’ll be sure to put up more of my own impressions and findings. As always, feel free to send me any questions regarding this, or any other social networking related issue. In the meantime, I’ll be sure to keep you all updated with any updates to Facebook’s security update. UPDATE! Patrick is the resident social media expert at DCT. He was born a member of the Internet generation, or rather, the generation that would become the Internet generation after Al Gore "invented" it. Growing up, he surrounded himself, family, and friends with computers, video games, mp3 players, and all of the other tech and gadgets that have come out of the 1990’s and 2000’s. In addition to social media, Patrick has a wealth of knowledge and experience using both Android and Apple iOS mobile devices as well as mac and pc computers. He is also an avid deal-hunter whose prowess has allowed him a relatively cheap venture into the world of hi-fi home and personal audio. Patrick graduated from DePauw University in 2011 with a degree in psychology and minors in communication and writing. Currently, Patrick is the lead analyst for Fizziology, a social media research company that specializes in using real people to evaluate and grade the sentiment of social media buzz.